LinkedIn Amps Up Recommendations. Pay Attention . . . This morning, I opened up LinkedIn to look at my profile. It’s an attractive presentation, and in it LinkedIn is making it very easy to do what is being quite clearly illustrated. Endorse/recommend the people you know as experts in the fields for which they claim expertise. It’s a no-brainer! You might think I’m going to go all snarky now and tell you why you should run away screaming from this new feature in LinkedIn. I’m not. It was a little weird to see this pop up, but the truth is that if you pay attention, near-automatic endorsements of the people you know on social networks is actually the kind of feature that makes sense—and makes social networks social. If you’re like most people I speak with, you’ve thought about this, just from a different perspective: Facebook is useless as a social networking tool; the world’s social networking behemoth is completely anti-social because by throwing everything against a big virtual wall Facebook renders almost everything uninteresting, and non-personal. The only time you see information is if it happens to cross your eyes when you look at your Facebook NewsFeed, or if you look at the profile/Timeline of a friend. Business-connection focused LinkedIn, like the Doctor-centric Doximity, makes more sense because it’s designed to help you do specific things with specific groups of people. I do think LinkedIn has been a bit too aggressive in the way they’ve rolled out their endorsement and recommendation feature. 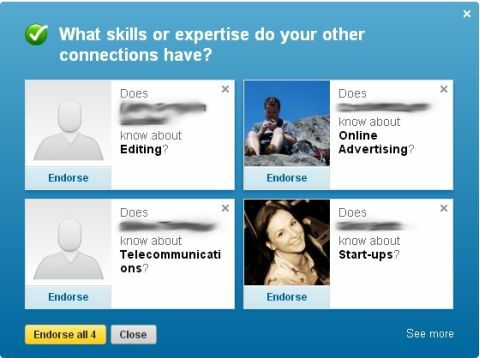 The four people LinkedIn had me endorse above weren’t the original four I saw, and when I deleted one, another popped up. When I got to this group, where I was willing to endorse all four and said so, four more popped up. Nevertheless, this really does further the business change goals of both LinkedIn and its members. I also found it amusing that the guy I mentioned in this piece on social networking enemies showed up in my slate of folks to be recommended. Of course, LinkedIn doesn’t know how I feel about my individual contacts, do they? As social networking continues to evolve, and we question what we trust about social networking, the idea of recommendations and what they mean will change. That’s business change. For you, the trick to handling this stuff starts with simply paying attention to what you do on-line. And of course, if you want help managing the process, you can always contact me here.